Bowdon will have to settle for runners-up spot in this year’s Inter-Club competition after losing 6-1 to Bristol at Wrest Park on Sunday. The only win was Ian Lines and Colin Irwin beating David Goacher and Roger Jenkins in the doubles to be 2-1 down at lunch. However, all four singles matches were lost in the afternoon. Heroic effort by Rob Essler in the deepening Wrest Park gloom won the Mary Rose trophy for Pendle and Craven in the final against Surbiton. Rob’s opponent, David Mooney had started off well, and was way ahead, but Rob crept back into contention. With David losing his so-far-reliable long hitting ability the game was Rob’s and the trophy Pendle’s by 4 games to 2. This also saved the manager the problem of having to finish off the pegged-down doubles in the dark (Pendle were ahead in it, but Surbiton had the innings). 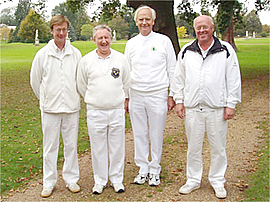 Bury Croquet Club’s first two-day advanced tournament was run at Heaton Park on the 22-23 September 2007. In very pleasant weather twelve contestants took part in a knockout with subsidiary weighted Egyptian. Time limits were imposed only on the latter. The winner was Paul Rigge, of Bury, who beat Southport’s Bob Burnett in a best-of-three final +3 +17. In the first game he went for a TP but was perhaps unlucky that the rover peel was only half successful, the striker’s ball overrunning into the wire. Bob then went round and pegged out Y, with K for 1, and almost held out in the two-against-one. In the second game Paul eschewed peeling and got a steady win. He also secured a handicap reduction to scratch. The Egyptian was won by James Hopgood of Meadows. Round 1: J Hopgood bt Sylvia Steer +18 TP; Richard Griffiths bt Peter Wilson +20; P Rigge bt Liz Wilson +4; Ray Lowe bt Michael Steer +11. Round 2: Winn bt Hopgood + 17TP; Burnett bt Griffiths +17; Rigge bt Pidcock +17; Lowe bt Barrett +6. Round 3: Burnett bt Winn +24TP; Rigge bt Lowe +4. Final: Rigge bt Burnett +3 +17.